In August of 2018, the Dungeon Master Pastor, Rev. Rory Philstrom, led other clergy and people of faith on a first-of-its-kind, 4-day, 3-night Dungeons & Dragons retreat. With a mixture of gaming, learning, and Sabbath rest, this retreat explored the connections between life, ministry, and the world’s greatest roleplaying game. If you want to hear how it went – click here to read what the participants had to say. The first retreat went so well that we’re doing it again! If you want to join us on our next Pastors & Dragons retreat click here. Each day afforded hours of Dungeons & Dragons play, with daily game sessions run by Rory, the Dungeon Master Pastor. We engaged in a variety of play styles and explore all four tiers of play. People brought beloved PCs to the game or created new favorites. In addition, we explored the character creation process as modes of self-reflection and storytelling. We also had opportunities for people to try their hands at the DM seat for the very first time, as we mined the art of Dungeon Mastering for lessons in how to lead a community, engage others, and foster a high invitation/high challenge environment. Each day also featured time for plumbing the depths of the tabletop roleplaying genre for lessons in life, faith, and ministry. At Shire in the Woods, the natural surroundings provided a rejuvenating backdrop to finally get the rest that is so hard to find in our day-to-day lives. 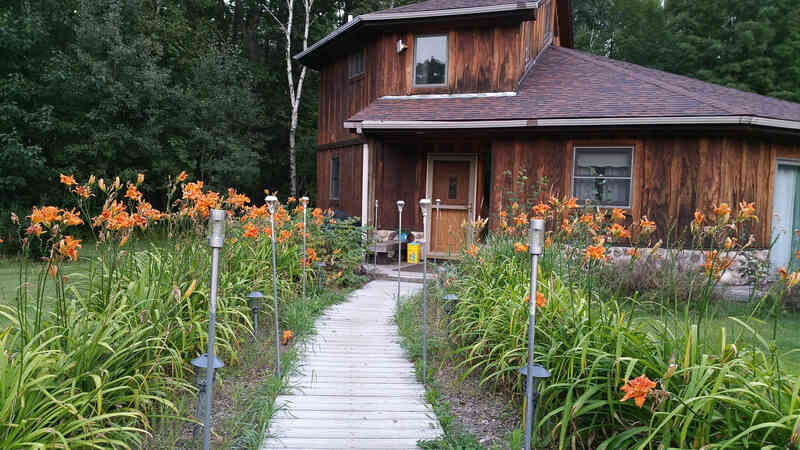 Located 18 miles east of northern Mille Lacs Lake, Minnesota, the retreat center is tucked away at the heart of the Solana State Forest and has the Soo Line South Trail running right alongside it. Some relaxed with a good book indoors while others took a stroll in the surrounding woods. There was more gaming, a labyrinth, a nearby swimming hole, a rose garden, a labyrinth, a beaver pond, a frog and turtle pond, tree swings and hammocks. There were many amazing options for some real life exploration and rest, and enough time in the schedule to take full advantage of it all. The Octagon was a unique structure and a great home base for our retreat. I’ve been on a bit of a hiatus from this little corner of the web, the DUNGEON MASTER PASTOR. But I’ve been thinking lately… about life and death. In Dungeons & Dragons, life and death is dealt with almost haphazardly. The game is built off of dealing death to horrible monsters and evil humanoids. To advance in the game, characters must learn to kill. The deaths of others bring life and flourishing (in the form of experience points) to the PC. And every now and then, a player character will fail in their death dealing and be dealt death themselves. As a pastor, I often deal with death. It comprises a much larger part of my job than I realized when I first dreamed of going into the ministry. I am often called to be with people in the final days and even the final moments of their lives. Then I am called again to help their families begin to grieve and try to understand what this death means in their lives. Sometimes a death, depending on its circumstances, will highlight a particular aspect of a person’s life. Sometimes it will reveal some significance that had been previously hidden. Sometimes a death comes suddenly and unexpectedly, sometimes a death is the culmination of a long and drawn out process. Death can be unjust. Death can be welcomed. Death is always grieved, no matter the individual. As I think about life and death, I find there’s a lot in common between the deaths of my players’ characters and the deaths of my parishioners. They each highlighted something special about the characters, they added a layer of meaning that was more difficult to discern before. My task as a preacher is to speak a word of meaning and purpose into the foggy loss of grief. It is to speak the resurrection, when the cross is presently felt. My task as a dungeon master is much the same. When one of my players’ characters dies, that death should ring with significance. I figure that there’s enough unearned suffering in the real world that in the fantasy world I build as a Dungeon Master I want death to mean something. Maybe that significance is to highlight the bravery of the fighter as they face down the demon unafraid of the consequences. Or maybe that significance is that the bumbling and ill-fortuned character finally bumbles too far into ill-fortune. As a DM, this means that sometimes I don’t let the dice stand as I roll them. I will blunt the edge of a more meaningless demise in favor of a better one later on. Maybe that means an NPC ally rushes in at those final moments and stabilizes a dying character. Maybe it means that the monster suddenly has a few fewer hit points when I realize that the heroes won’t last another round. As a DM, making death meaningful for the PCs also means that I need to strive to make the other deaths in the game meaningful. When the PCs lay waste to a maurading band of lizard folk, those deaths should mean something (both for the rescued villagers and also for the larger colony of lizard folk that band hailed from). The death of a major villain should reverberate throughout the ranks of that villain’s followers, and perhaps inspire the villain’s apprentice or rival to avenge that death. A monster’s death might reveal a hidden fact about the life of that creature that the characters discover as they are looting the body. All this is just another way to say that the actions of the PCs should affect and reverberate in the fictional world, perhaps especially so when that action is dealing death. Making death on the tabletop into a meaningful experience is as much a part of the Dungeon Master’s task as making death in real life meaningful is a part of the task of a pastor. Death is an opportunity to tell another part of the story, whether that’s the story of a player character or the story of a person’s life and God’s love and the kingdom of heaven. The alternative, often realized, is devolving into a raging bunch of murderhobos.